Today, you have all technology you need to run a business online. And there are certainly no shortage of ideas for online businesses that you can start if you have not done so already. Instead of hiring several people to do a particular job, you can do most of the work on your own and outsource tasks whenever necessary, without feeling the burden of having employees. That’s what being a solopreneur is about: you have full responsibility for your business, but you also enjoy all benefits and freedom that it brings. However, you can’t be always be successful without using the right tools. After all, the tools are what is going to save you the time. And that is crucial when you are a one-man show. This is a digital wallet and payment processing software that enables you to send invoices in seconds. Can’t beat that! Being a solopreneur means that you’re taking care of your company’s finances alone, so you need a system that helps you stay organized. With Due, you’ll have full control over the budget, on top of all the other features they offer. The system is fast, transparent, and very secure. So you certainly should not have any worries there. 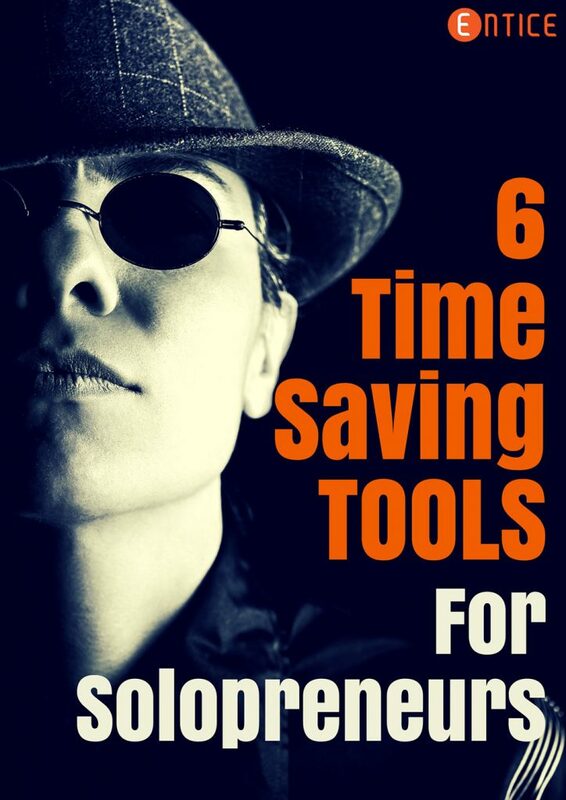 You’re a solopreneur, but that doesn’t mean you have to do everything alone. You will still need to delegate at least a few tasks, but doesn’t mean you have to hire full-time employees. One of the tasks you could easily outsource is content marketing. Every business needs a blog nowadays; that’s how customers get informed about the products and services you offer. If you have no time to blog, or create social media content and other related tasks, you can hire a writer whenever you need them. You can also make use of some of the other services, if and when you need them, such as editing. The last thing you want to do is to spend your days sending emails to clients, customers, and business partners. It’s also super important your emails to be sent at just the right moment; otherwise you risk being overlooked in a sea of emails. Boomerang can also send follow up reminders, so you won’t lose track of important messages that were not answered within a certain period of time. It’s important to connect with the people on social media. We all know that. However, it’s also not always easy to meet and connect with new people. What if you could almost automatically connect with people who landed in your inbox every day? That’s what Rapportive is all about: it enables you to connect with relevant contacts, it provides the information you need, and it encourages you to take action. You’ll get information about the location, profession, and job of the person you are emailing with. You’ll also see the shared connections. Then, you can connect with these people straight from your Gmail inbox, so you’ll save yourself valuable time. Instead of searching LinkedIn for the right people, Rapportive will do that for you. So go grab rapportive right now, and start expanding your LinkedIn connections today. Who needs a secretary when you can use a browser-based tool to schedule your own meetings? Sounds too good to be true, right? Assistant.to keeps track of your schedule and works with the recipient of your message to find an available time that works for both of you. Plus, it remembers your common meeting locations, so it gives you suggestions that help you arrange a meeting in seconds. It will get rid of the confusion that comes with different time zones too. Now that is something we all need, in this interconnected and online world. Assistant.to will send also notifications for any scheduled or rescheduled meeting. And here’s the best part: it’s free! This is a really useful sales and marketing intelligence platform. are important for your marketing strategy too. Unomy is a valuable source of information about your competitors, their employees, social media activity, technologies, patents, press releases, and much more. information you need in an easy to use format. Time saving at it’s best! Solopreneurs are certainly relieved from the pressure of taking care of employees. This helps us all save a boatload of money, since we do most of the work alone. However, that also means that the pressure is much greater, because you have to find a way to be as productive as possible within the time available to you each day. I hope the tools listed above will help you organize your workflow, use the right tools to find connections, and successfully outsource some tasks. All to save you time! Kate is a writer for Assignment Masters, a professional writing services company. She is interested in promoting productivity methods for entrepreneurs, bloggers and content writers. Feel free to reach her on Twitter.